Cover story of Shares Magazine on 2 September 2010. Original article here. Global warning and the likelihood of long-term rises in the cost of fuel mean the case for going green is as strong as ever. Fears over subsidy reductions have hit many fledgling alternative energy stocks hard but, as Jessica Furseth explains, there are firms out there which look set to thrive, whatever the financial market on environmental climate. The case for going green is clear. We need to get a grip on global warming and secure our energy supply for the day when oil, gas and coal run out, or at least become prohibitely expensive. 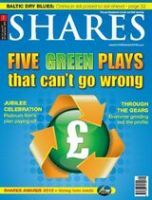 While subsidies are in place to speed things along, boosting green investment and penalising carbon-sinners, Shares’ favourite plays are the ‘accidentally green’ companies which receive little or no direct support. They not only stand on their own two feet, but also hold their ground against conventional players by offering a competitive return on investment with superior, energy-efficient products. Our preferred picks are AFC Energy, because it takes a resource which is currently wasted, namely by-product hydrogen, and turns it into energy; Oxford Catalysts, for its breakthrough in utilising flare gas and other deposits previously deemed too small to exploit; hydrogen play ITM Power; environmental consultancy RPS Group, which aids corporations in their efforts to reduce their carbon footprint; and, for international exposure Greenko, a firm making strides with green energy rollout in India. The UK is lagging behind its target of generating 15% of its energy from renewable sources by 2020, the new government has admitted. The Confederation of British Industry estimates £150 billion in private investment is needed to reach this goal. The Department of Energy and Climate Change will launch a new business plan following October’s spending review, and this could bring much-needed clarity for companies looking for investment. It is well known that energy secretary Chris Huhne wants to speed up the planning processes for renewable energy plants. He has already allowed local councils to start generating energy to sell to the grid and pledged to cut carbon emissions by 30% from 1990 levels by 2020, even floating the concept of a green investment bank. While there is plenty of blue sky potential, it is essential to bear in mind the green journey is a thoroughly long-term one. The boom-or-bust nature of the cleantech sector has made for great share price volatility. Punters should therefore approach in the knowledge many of these technologies are unproven or not yet commercially viable, despite their revolutionary potential. We face decades of transition where old and new technologies and energy sources will continue to co-exist, tinkering away at ideas how to solve our environmental problems. Diversification is key, as well as asking a few key questions. * Does the technology work? Investors should look for regular technology updates from the earliest stage companies to ensure progress is being made. The developer of a cutting-edge energy-efficient material known as quantum dots, NanoCo, regularly issues reports on its development agreement with a major Japanese electronics company. Milestone payments are released each time the technology progresses towards the goal of providing back-lighting for TVs. * Is the technology commercially viable? Always consider how the company plans to make the technology commercially viable. Superconductor specialist Zenergy Power has experienced order delays but a number of deliveries of the energy-efficient products have been scheduled for this autumn. The company hopes the user experience will act as a catalyst for further orders. * Is the company running out of money? You simply must look at a pre-profit company’s cash burn, particularly relative to how much money they have left. A quarterly burn rate of A$6 million meant Ceramic Fuel Cells had to turn to the market again last month (19 August), raising A$17.4 million even though it raised A$33 million in April 2009. The company expects this will fund operations ‘for at least 12 months’, taking it to ‘the next stage of commercial development’. * What is the return on investment? Would-be green punters should always asses how long it takes before the cost of adopting the new product or technology is recouped from energy savings. The combined heat and power (CHP) unit from Energetix should see payback in four years, says the company, or around two years with the current UK feed-in tariff. * Who will buy it? A big player having taken an interest is usually a good sign here. Power giant Centrica owns 9.9% of fuel cell group Ceres Power. The green ‘boilers’ have been subject to delays, but plans have been made to sell them through the British Gas distribution network. * Does the company depend on subsidies? If the company relies on subsidies, it is vital to consider how secure these incentives are. Support for biomass is guaranteed only until 2013, prompting coal station Drax to call for a more stable system before it invests further. Helius Energy was not deterred, however, announcing plans for a 100 megawatt (MW) plant in Southampton (16 August). Lastly, it is worth remembering that because cleantech development takes time, stocks might rise and fall as they are hyped up and then stumble as investors lose interest in one market darling before moving on to the next big thing. ITM Power’s admittance that any notable traction for hydrogen-fuelled cars is at least five years away is unusual, as companies will rarely speak of events further than three years into the future as this is generally too taxing for investors’ patience. Even so, delays beyond the initially stipulated timeframes are commonplace with ground-breaking technology. The risk-tolerant, patient cleantech punter should choose stocks he or she genuinely believes in, and then put them away and wait. The UK market for cleantech is relatively small, meaning international diversification comes highly recommended. Bruce Jenkyn-Jones at Impax goes as far as saying the UK is ‘not a great place to invest in cleantech’, but there are still a number of UK-listed companies with international exposure all the same. One of these is Dialight, a leading provider of next-generation LED (light-emitting diode) lights for traffic control systems in the US and Europe. The LEDs ensure up to 90% reduction in energy consumption, ensuring a two-year payback period on a traffic light guaranteed to last at least five years. ‘We think the LED sector is quite interesting. Costs are falling dramatically, so it is increasingly more competitive with traditional lighting,’ says Jenkyn-Jones. LEDs are expected to be able to vie with domestic light bulbs by 2020, but until then growth from industrial applications should continue. July’s half-year results from Dialight showed revenues up 33%, to £26.2 million, driven by ongoing strong growth in obstruction lights for wind turbines and mobile phone towers. Greenko is investing heavily into renewable energy capacity in India, with 430 MW of its total secured capacity of 587 MW already under development. In the year to March, the group increased its turnover by 39%, to €19.3 million, and generated pre-tax profits of €4.9 million. ‘Our primary focus is to build out our assets,’ says Mahesh Kolli, co-founder and managing director of £165 million cap Greenko. ‘Renewable energy is a mainstream energy in India,’ the director asserts, because it is quick to build in a country with significant energy deficiency. Last week (26 August) a potentially game-changing carbon capture project was proposed by a consortium of companies including AFC Energy. A 500 MW demonstration plant has been proposed at a Rio Tinto site in Northumberland, where partners B9 Coal, consultants WSP Group and Australia’s Linc Energy will work with AFC. Linc’s underground coal gasification technology will be used to turn coal into liquid, and the resulting gas will be separated into hydrogen and carbon dioxide. The hydrogen runs AFC Energy’s fuel cell, while 90% of the carbon will be stored. The AFC fuel cell can utilise 60% of the energy derived from the coal, compared with the 30% efficiency of traditional coal power stations. The plant will churn out electricity at about 4p per kilowatt hour, according to the consortium’s calculations, a level which would make the scheme competitive with conventional energy sources. While the fuel cell industry has tested investors’ patience in its efforts to become commercially relevant, AFC’s alkaline technology benefits from being significantly cheaper. AFC’s main activity has so far been to utilise waste-product hydrogen from corporations, and is working with chemicals giant AzkoNobel in Germany to turn its ‘waste’ into electricity. Subsidies have been necessary to shore up the development of industries such as wind and solar power, as the higher cost means they are not yet competitive with conventional energy. But this support can be lumpy; the solar industry is now stabilising following a year of vast over-capacity, which crushed prices after manufacturers ramped up production to meet demand created from a short-lived spell of very favourable incentives in Spain. Italy, Japan and the UK have since increased their incentive for the take-up of solar panels, only for a surprise cut in Germany, the world’s biggest market, to curb enthusiasm for solar just as it had begun to recover. Set to grow installed capacity by 76% in 2010, the industry is expected to grow only by 14% next year due to the move in Germany. Panmure Gordon analyst Mark Davis expects PVCS will grow more than the overall industry next year as it increases sales into growing markets in Asia. The company expects to ship 320-340 MW worth of product this year, up from 239 MW in 2009, with higher volumes compensating for price cuts. In the UK, August saw energy regulator Ofgem announce 4,457 solar panels having been installed since the incentive started in April. Volumes are rising month-on-month and should accelerate as awareness spreads. ‘The feed-in tariff is the least bureaucratic incentive to boost uptake,’ says Dorrity. Service company Eaga is progressing with solar installations on social housing, from which it will collect the feed-in tariff. The group also remains the key player in home insulation, an area noted as a priority by energy secretary Chris Huhne. Despite the deadline being only weeks away (30 September), only around 10% of the UK’s 4,000 biggest companies have so far submitted their proposals for how they will comply with the mandatory Carbon Reduction Commitment (CRC) energy efficiency scheme. Any company or public sector organisation consuming more than 6,000 megawatt hours (MWh) of energy per year, equivalent to a power bill of around £500,000, will either have to cut their carbon emissions or buy permits to pollute. A 6,000 MWh a year consumption rate would mean paying £38,000 every year in carbon permits if nothing is done. Sabien Technology CEO Alan O’Brien points out: ‘Many organisations already have the structures and processes in place to effectively manage their energy consumption and carbon emissions, and will be well placed to benefit from the CRC.’ This includes having installed smart meters, which provide detailed information of energy usage. Bglobal is the main pure-play on smart meter installation in the UK, which has until now been focused on businesses but should eventually be rolled out in private homes. Sabien manufactures a device which, when fitted to a boiler, cuts energy costs by one quarter and slashes carbon dioxide emissions by 35%. A £500,000 contract with Greenwich Borough Council came in after the cut-off for Sabien financial year (30 June) but the group reported a sales pipeline of over £3 million. Last year Sabien’s revenues came in at £675,000 although the firm did record a pre-tax loss of £825,000. Another straightforward way to save on energy costs is a voltage optimiser, available from among others Active Energy, formerly known as Cinpart. The device will control the amount of power drawn from the grid. As what comes through the plug is too much, 10% to 15% is cut off the bill by only taking what is needed. Rising energy costs have now made the devices worthwhile, with a payback time of 18 to 36 months, not to mention the carbon saving credits. Earlier this year the government announced a £100 billion programme to build 25,000 MW worth of offshore wind capacity over a 12-year period. This is a massive undertaking, which involves developing new seaworthy turbines, infrastructure and grid connections. SeaEnergy decided earlier this summer to withdraw from wind farm development and focus on the infrastructure side of what its chairman Steve Remp has described as ‘the next North Sea adventure’. Last month the £17 million cap announced an agreement with Dutch offshore access solutions group Ampelmann, as it positions itself as a marine services business for the offshore wind industry. Meanwhile, Scotland’s BiFab, part-owned by Scottish and Southern Energy, has turned its hand to making tidal energy turbines for Scottish Power. Like SeaEnergy, the company has leveraged its expertise from the oil and gas exploration sector and applied this to offshore wind. The high start-up costs mean it is the big utility companies that drive the UK’s offshore investment. Scottish and Southern Energy is a key player as it already derives 2,200 MW, or 20% of its power, from renewables. The company has rights to 6,000 MW worth of offshore wind being developed off the Scottish coast – equivalent to six large coal-fired power stations. Traditional energy companies, on the other hand, appear to be less interested in going green. Jeroen van der Veer, former CEO of Royal Dutch Shell, said shortly before retiring last year the company was planning to drop all new investment in wind, solar and hydrogen energy. The oil major indicated the decision, announced at its annual strategy update in March, had been taken because renewable developments were struggling to compete with other investment opportunities in its portfolio, namely oil, gas and biofuel projects. In April, not long before the rig explosion that led to the Macondo oil spill in the Gulf of Mexico, BP by contrast committed to spend more than $1 billion on alternative energy projects in 2010. It remains to be seen if this investment will be maintained in light of its new financial circumstances. There may be some pressure to do so, given the environmental damage caused by the spill, and in fairness BP spent $1.3 billion on alternative energy in 2009. Still, at around 6% this represents a very small proportion of its overall capital expenditure. Posted on 12/16/2010 by Jess. This entry was posted in Business features, Climate change and cleantech, Technology features. Bookmark the permalink.